Planning a trip to Paris? Public transportation is often the easiest and least expensive way to get around. We visited Paris with our two children, ages 11 and 14, last summer. Our apartment in the 13th Arrondissement was a few kilometers from top attractions like the Eiffel Tower, Notre Dame Cathedral and the Louvre. The Palace of Versailles and Disneyland Paris – outside the city – were also on our itinerary. We relied on public transportation every day of our trip. We learned a lot about the Paris Metro and other public transportation like taxi and Uber. Here are my top tips for using public transportation in Paris, France with kids. Before our trip, I was a little intimidated by all these options. However, I found it a lot easier once I arrived. The Google Maps app on my phone was a great tool for planning routes and schedules in advance. We usually found public transportation information easy to follow, even with very limited French. However, Metro stations are large, with multiple levels and maze-like corridors. You may have technical difficulties with your ticket. It’s possible make a mistake and get on the wrong train or bus. Strikes and weather can delay trains. It’s all part of the adventure, and we got the hang of it by the 2nd day. Just give yourself 15-30 extra minutes any time you need to arrive somewhere at a specific time. It will save you a lot of stress. You can purchase individual fares every time you use Metro, RER or bus routes. This might be a good option if you are staying within walking distance of places you plan to visit. When we visited London, we expected to use the Underground, but never did because our hotel was centrally located and we walked everywhere. In Paris, we booked an apartment farther from top attractions. We used the Paris Metro at least twice a day. It made sense to purchase the Paris Visite travel pass, which allowed us unlimited use of the Metro, RER and bus during our stay. It was so convenient, and it saved us money. Visit the official site at https://www.ratp.fr/en/titres-et-tarifs/paris-visite-travel-pass to learn more. If your French is limited, buy online. Many Parisians speak English, but we were sold the child pass (ages 4-11) for our teen daughter because the man who helped us at the ticket counter spoke little English. We were later charged a fine for this (which almost exactly covered the cost difference). Planning to visit Disneyland Paris or Versailles in the Paris suburbs? Make sure you purchase the pass that includes all 5 zones. This extended zone pass also includes both major airports. Metro was our default, but sometimes the bus was the best way to get where we wanted to go. There are bus stops all over, and Google Maps helped me figure out which one we wanted, at what time. One huge advantage to riding the bus is that it has big windows and you’ll stay above ground. You can see a lot of Paris inexpensively just by riding the bus. Shortly before our trip, I was alarmed to learn that public transportation workers would be on strike during our visit. It turns out that strikes happen somewhat regularly in Paris, and they won’t necessarily disrupt your plans. Strikes are announced in advance and published online. The strike didn’t affect the entire system, just selected routes. More recently, “Yellow Vest” riots have made news in Paris. You wouldn’t want to stumble into the middle of these, if you can avoid it. Whether in France or anywhere else, it’s smart to follow current events for your destination and plan around them. Taxi and Uber are convenient, but they can be more expensive and not get you there faster. Good times to use taxi or Uber are late at night, when you have luggage or when public transit is limited. We took RER from the Orly airport into Paris on our way to London, and it’s definitely the least expensive option if you are only paying for 1-2 people. With a family of 4, we found that a taxi or Uber may not cost more than the train. Our trip from Orly to the Eurostar station via train cost $57 while the trip from our apartment to Orly via Uber cost $42, plus tip. The first trip was a few kilometers longer, but you can see that taking the train may not be cheaper for a family. Uber may cost less than a taxi and the app makes it convenient, but it’s not always the best option. When we returned to Paris from London, we decided that connecting with an Uber driver at a crowded and unfamiliar train station would be tricky. There was a line of taxis waiting, and it made sense to just take one of those. The trip cost $27 and taxis generally take credit cards. Click the button to read more of my tips for using Uber with kids. Perhaps you’ve heard horror stories from friends, family or the internet about pickpockets in Paris. I heard them, and it made me feel anxious. Once we arrived though, I felt no less safe on the crowded Paris Metro than I did in New York City, Washington D.C. or at home in Salt Lake City, Utah. We rode public transportation every day with no problems. It pays to take a few precautions so you won’t be an easy victim. Keep wallets in your front pocket or at the bottom of purses and bags – out of easy reach. Don’t keep anything valuable in backpacks, and don’t wear them on your front. Try to use technology or ask someone official when you have questions. 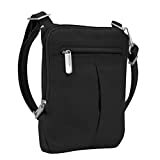 For extra peace of mind, I purchased a Travelon anti-theft travel purse on Amazon.com before our trip. It has a locking zipper, anti-slash fabric and RFID blocking. This little purse is so convenient, I use it at home too. The essentials are at my fingertips and it’s too small to collect a lot of heavy junk. Bonus: It’s machine washable. Public transportation is a great option for families in Paris. I hope our experience helps your family plan a great trip!